Beautuful townhouse, 2 bed 1.5 Bath with private gardens both front & back, rooftop solarium over looking the pool and parking directly outside. We purchased this superb town house in March 05, prior to buying it it was owned and used infrequently by a German couple who furnished it lovingly and tastefully leaving nothing out. From the rear of this well equipped house is the garden with patio area for lunching and a beautiful swimming pool suitable for all ages. We have recently installed air conditioning to the master bedroom. The house is child friendly, the back garden is enclosed with gate and for older children they can still be kept insight while you sip your vino blanco (white wine) and they enjoy the pool. Within a 5 minute walk is the Los Dolses commercial centre, which host restaurants, bars, banks, a small English supermarket for your PG tips and local newspapers, as well as a larger Spanish supermarket. Torrevieja boasts a wide range of shops from very large supermarkets, to a new shopping centre recently opened. Within a few minutes drive are numerous blue flag beaches offering a wide range of activities, for adults and children alike. 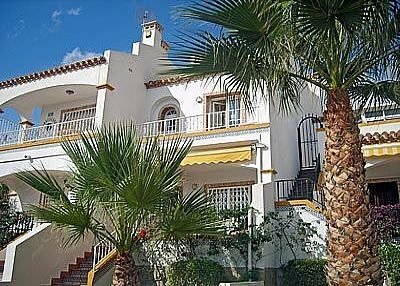 Los Dolses is nestled between 3 superb golf courses, Villamartin, Campoamor and Las Ramblas all are within a short drive. Green fees are from as little as 40 euros and can be booked prior or whilst on holiday. The area serves English tourists very well most places speak English however any attempt to speak Spanish always goes down well. Be assured that while you are on holiday you are not alone there are many English people around all very friendly and willing to help out should you require anything, also our managing agent lives opposite and are able to help you if you have any problems whilst on your relaxing holiday. For larger parties, we can arrange seperate accomodation in the same complex making it ideal for 2 families. Air conditioning in the master bedroom. The property benifits from a private roof top solarium for those who do not wish to be disturbed.